Although not long, its generous fairways, lush grass and links type greens offer the visitor many different challenges and tests of shotmaking to score well – and fun too for golfers of all abilities! Overlooking the historic holiday town of Burntisland, the views over the Firth of Forth and towards the famous Forth Bridges are truly stunning. Edinburgh Castle is visible from the aesthetic 8th hole. 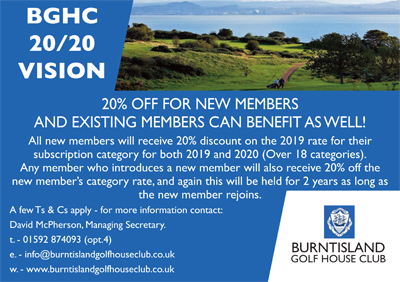 Come and enjoy Burntisland Golf House Club and the Willie Park experience – his only course in Fife – you will be glad you did!